Home Website WordPress How To Use WordPress Toolkit In Plesk Onyx? How To Use WordPress Toolkit In Plesk Onyx? Plesk Onyx is the most popular control panel solution on the web alongside cPanel. With full compatibility with Linux (CentOS, Ubuntu, Debian, Cloud Linux, and Red Hat Linux) as well as Windows operating systems, more than 100 third-party extensions, Github and Docker integrations, and other more potential benefits for website administrators, Plesk Onyx has also been working to differentiate it from other control panels for content management system (CMS) users. 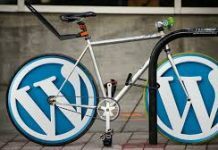 The WordPress Toolkit—an ultimate answer to automating cloning/staging, ensuring high-security standards and utilizing mass-management features—is the headline product of those efforts. As the most widely-used CMS on the planet, WordPress currently is powering a surprising 28% of all websites on the internet, for a market share of nearly 60% and remaining the fastest growing CMS followed by Shopify and Squarespace. It especially gains great popularity among bloggers, small to medium-sized businesses, entrepreneurs and enterprises with the purpose of growing their audiences and engaging with customers. Plesk Onyx comes with two versions of WordPress Toolkit. The full version is included with Plesk Web Host Edition and Plesk Web Pro Edition, while the SE version is included with Plesk Web Admin Edition. 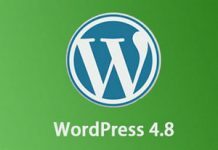 The biggest difference between the two versions is that advanced features including cloning a WordPress instance, staging environment, and sync data between WordPress instances are only available with the full WordPress Toolkit version. But both WordPress Toolkit flavors enable for installing new WordPress instances, adding existing WordPress instances, migrating remote WordPress instances, 1-click hardening of WordPress, mass management of WordPress instances, and managing WordPress plugins and themes. Considering the fact that web administrators who manage sites for an employer, a business, or for themselves rarely need management of customers, resellers or subscriptions but simple website and domain management, Bisend offers Plesk Web Host Edition to all its WordPress hosting customers. In other words, every customer can have access to the Plesk WordPress Toolkit SE version. How to Use the WordPress Toolkit? The Plesk WordPress Toolkit is developed for easy installation, configuration and management of WordPress. Like we’ve mentioned in the previous tutorial—How To Start A WordPress Website With Bisend, the Plesk WordPress Toolkit makes installing a WordPress instance ease of use. Go to Websites & Domains > WordPress and then choose between Install (Quick) and Install (Custom) to have a new WordPress instance installed. There is no big difference between the two installation options. Install (Quick) refers to an express installation, meaning that the latest WordPress version will be installed and default settings will be used. But with Install (Custom), you will be granted the ability to change the default installation settings, such as selecting the desired version of WordPress, the administrator user setup, specifying the database name, etc. If you have a WordPress website hosted elsewhere and want to migrate it to Plesk Onyx, you can leverage the Website Migration feature and manage it using the Plesk WordPress Toolkit. Detailed website migration process has been offered in our How to Migrate Your WordPress Website to Bisend. Another highlighted feature comes in the Plesk WordPress Toolkit is the simplified management of plugins and themes. Not only WordPress installations have a specific tab, but also WordPress plugins and themes have theirs, with which you can install, activate, deactivate, uninstall and update the plugins and themes easily. To install a plugin for WordPress, go to Websites & Domains > WordPress > Plugins. Click on the Install button and then search for your desired WordPress plugin, select it in the list and install it on one or more WordPress instances. All newly installed plugins by default will be activated immediately. If you find unsatisfied with certain plugins, you can deactivate and uninstall them by select the checkboxes next the names of WordPress installations on the same WordPress page. If there are new updates available for your WordPress plugin installations, just select them and click on the Update button. If you want to manage your WordPress themes, go to Websites & Domains > WordPress > Themes and do similar operations as with managing WordPress plugins. 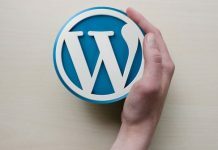 Amongst all of the key security features with the Plesk WordPress Toolkit, the 1-click hardening of WordPress stands out by applying concepts like “defense in depth” and “latest privilege principle”, testing lots of known and potential attack vectors, preventing your WordPress websites from risks and attacks. You can check and secure WordPress installations using the Plesk WordPress Toolkit. Go to Websites & Domains > WordPress. 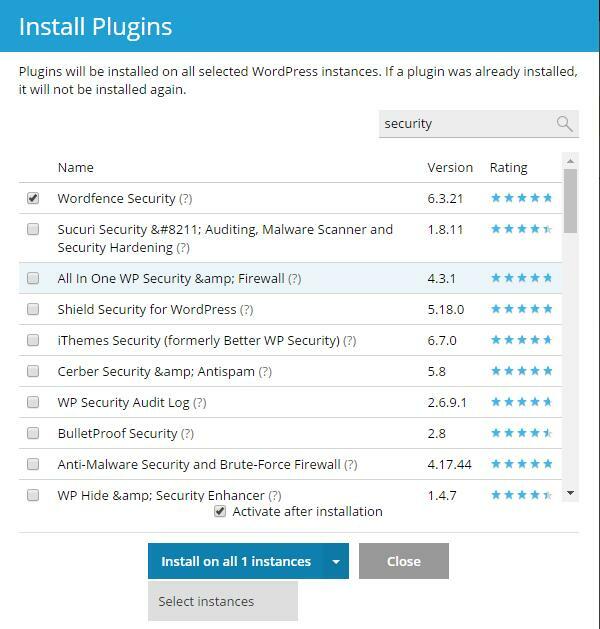 Select the WordPress installations and click on Check Security underneath the Installations tab. You will be offered the results of the security check for the selected WordPress installations. 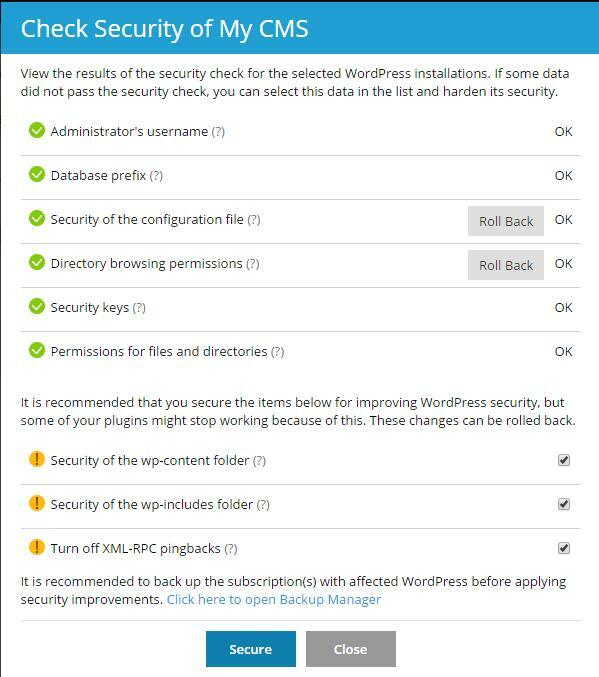 If there is any data failing to pass the security check, you’re recommended to secure the items for improving WordPress security by selecting them and click on Secure button. Keep in mind that some security improvements cannot be rolled back. So you’d better have a copy of the corresponding subscription before starting securing your WordPress installations. 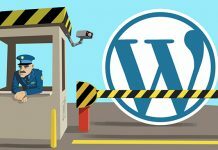 As a web administrator, you may find making changes to a WordPress website time-consuming and even complex when you are running multiple sites. The Plesk WordPress Toolkit keeps great user-friendliness that is adhered to Plesk control panel all the time; at the same time, it exclusively gives WordPress users a set of powerful tools to empower the WordPress websites. Previous articleWhy Bisend Kentico Hosting Should Be Your First Choice? Next articleHow to Stop Unauthorized Login Attempts to WordPress? How to Backup & Restore Your WordPress Site? How to Migrate Your WordPress Website to Bisend?